Air quality is something discussed on the news and by environmental experts every single day. 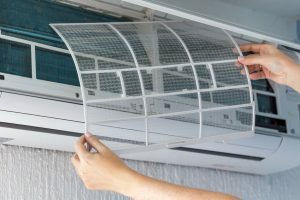 And considering that air pollutants like dander, dust, and airborne chemicals are circulated through your home’s HVAC system anywhere from five to seven times daily, it should be something you’re talking about too. Keeping your home clean can be a struggle. But cleanliness is just as important in your air as it is on your household surfaces. If you’re wondering exactly how to keep your air (and your lungs!) clean, then keep reading. We’re about to take a look at a few of our best tips for improving your home’s air quality. Why is home air quality important? Before we get into our cleaning tips, it’s important to understand why indoor air quality is so important. For starters, your home is likely where you spend the majority of your time. As such, particles from different types of attic insulation, HVAC ducts, pets, and other surfaces are constantly flowing in and out of your lungs. Not only can these affect your home’s air quality, they can affect your health. If you’re constantly breathing in those particles and allergens, your allergies could flare up, your asthma could get worse, and your overall quality of life could suffer. Now, it’s time to get into our tips for improving your home’s air quality. Let’s get started! Open the Windows: No matter how often you’re cleaning your ducts, the air quality in your home isn’t going to get better if the same, stale air is still circulating. Let some fresh air in every once in a while to break up the allergens in your home. Invest in Plants: Plants are nature’s air purifiers. Investing in a few good house plants (and taking good care of them) will ensure your home’s air stays a bit cleaner and greener! Keep Clean Ducts: If you have clean ducts, you’re in a good place. A professional duct cleaning can clear out harmful allergens from your home and let you breathe a little easier. Keep the Pets Groomed:Pets shed. And when their grooming is left to the wayside, your air can get clogged up with fur and dander! Make sure you’re brushing and grooming your pet regularly to minimize animal particles in the air. Whether you’re in an apartment or a mansion, these tips will help you create a cleaner environment where you live. Are you ready to start breathing easier?